Since I still have some pictures with turqoise theme, I thought it will help those looking for ideas on how to decorate their hantaran. 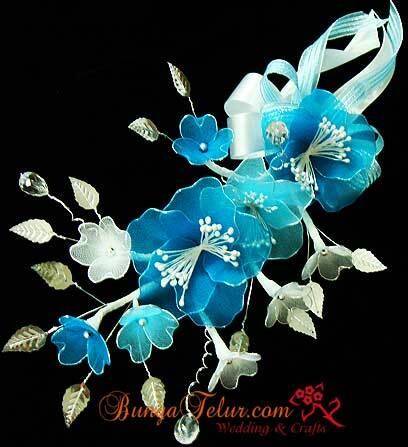 This is the picture of bunga dulang stokin I made for a customer’s wedding in May. I didn’t do the hantaran for her as she bought bunga dulang and asked her neighbor to do her hantaran. The above picture was sent through email from her personal collection to show how my bunga dulang were used to decorate her hantaran. 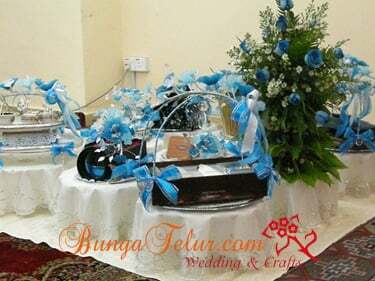 She also ordered bunga dip in turqoise and white color for her bunga pahar. I was unable to attend her wedding and take those pictures myself.